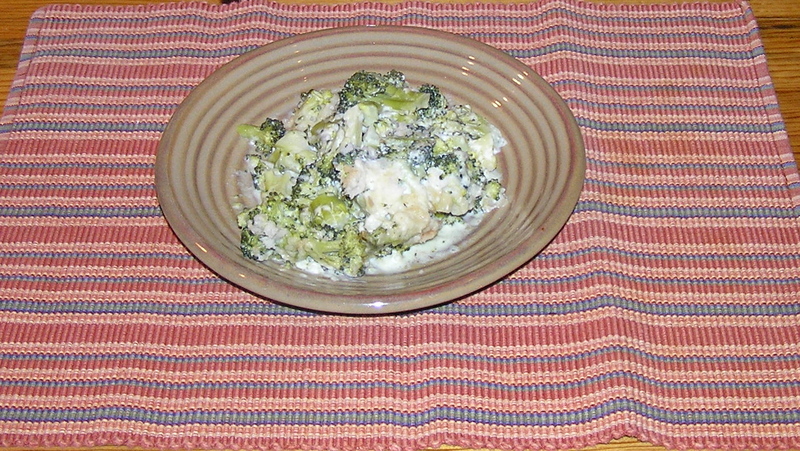 The second dish I made was a gorgonzola and broccoli casserole that could also be made ahead and baked the next day. This is a Sunset recipe that I lightened up by using low fat ingredients to substitute for the full fat ingredients in the original recipe. I shaved 5 grams of fat/serving just by using non-fat milk and reduced fat cheeses. By the way, if you can’t find reduced fat gorgonzola, you can use reduced fat blue cheese, which is pretty widely available. I actually was in such a hurry to bring my goodies down to my neighbor’s in time, that I forgot to take a picture of the beautiful casserole, fresh out of the oven with its golden crumb topping. Too much time soaking in the giant bubble tub, I guess. So the only photo is of a plate of leftover casserole, which doesn’t look as good, but tastes delicious. If you are not making this ahead, preheat oven to 350°. In a 5- to 6-quart pan over high heat, bring about 3 quarts water to a boil. Rinse broccoli and trim off and discard tough stem ends (I used broccoli crowns, so there was very little stalk). Cut broccoli into 1-inch pieces. Add to boiling water and cook just until barely tender when pierced, 3 to 5 minutes. Drain and set aside. Rinse and dry pan you cooked the broccoli in. Add 1/4 cup butter to pan and melt over medium heat. Stir in flour and salt, whisking until smoothly blended. Cook until bubbly, about 1 minute. Slowly add milk and whisk over medium-high heat until mixture is boiling and thickened, about 3 minutes. Add cream cheese and gorgonzola or blue cheese; whisk until smoothly blended. Stir in broccoli. Pour into a shallow 2 1/2- to 3-quart casserole dish (I used my 10 x 13 ceramic baking pan that I use to make lasagna.) If you are making this ahead, you can put this in the refrigerator at this point and finish it up the next day. In a blender or food processor, whirl bread cubes into coarse crumbs. You should have about 1 1/3 cups. In a small bowl, mix crumbs with 1 tablespoon melted butter. Sprinkle evenly over broccoli mixture. Bake uncovered at 350 until casserole is hot in the center and crumbs are golden, 20 to 30 minutes. Makes 12 servings at about 6.5 grams of fat/serving. The previous recipe for Lamb-Stuffed Eggplant said to hollow out the eggplant, and discard the centers. This seemed very wasteful to me. And I am sure that my good Mumbai housewife friends would be horrified at the thought of wasting all that good eggplant meat. Frugality – or rather who was most frugal in tending home and family – was a frequent topic of conversation. In late afternoon on our way back from the open air market across the railroad tracks, we would gather in Mrs. Bidikar’s ground floor corner apartment…the one with the best view from which to see and comment on passers-by on Goregoan Road. Sandals left outside the door and saris draped comfortably around us, we drank sugary, hot black tea boiled with milk and spices – the original chai – and we would share the contents of our market baskets, discuss prices and which merchant was honest or a thief. Women would regale one another with how they used every bit of the produce to stretch their husband’s salaries. One confided that she was more frugal than another – using even the stems of cauliflower or finding a use for potato skins. So wasting the interiors of eggplants – I think not. Being of equally frugal bent, while the stuffed eggplants were baking, I chopped up an onion and the innards of the eggplant, and sautéed them in a frying pan sprayed with olive oil cooking spray. I sprinkled them with dried herbs – marjoram, thyme, and chervil – but any combination of your liking would do, and added a bit of garlic. I cooked the mixture down until the eggplant and onions were quite soft. At this point, I could have tossed the mixture into a food processor and made a nice eggplant dip, adding bit of salt and pepper, or maybe even a spoonful or two of nonfat yogurt. But I really didn’t need dip, and I was in the mood for something warm. So I put the mixture into the refrigerator to keep until I had more time. 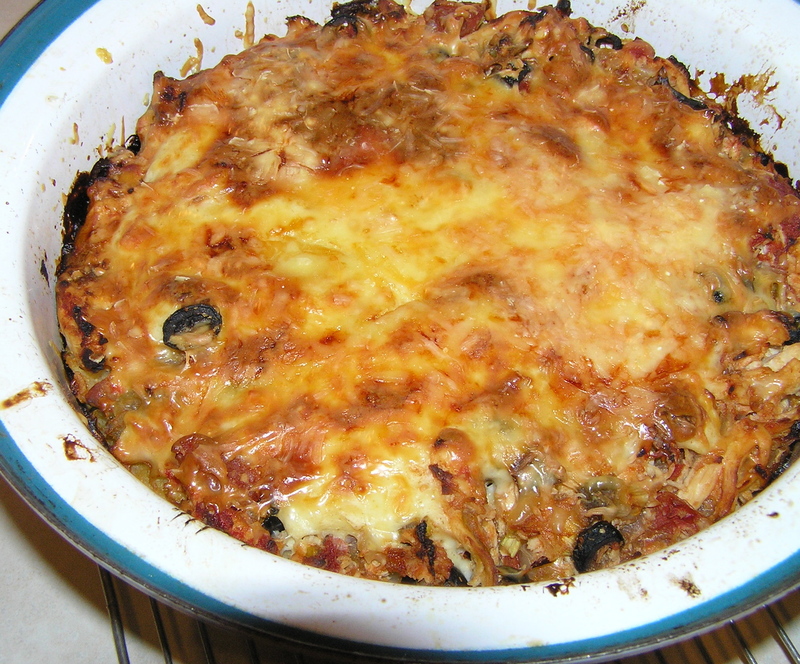 The next day, I decided to make a casserole similar to moussaka, the Greek eggplant and lamb dish. I had 3 ounces of ground lamb left, so I browned it and added it to the eggplant mixture (I think you could also make this meatless). I crumbled about 2 ounces of fat free feta cheese into the mixture, added about ¼ cup of fat free half and half, and 1/4 – 1/2 cup of egg substitute. I poured the whole thing into a baking dish sprayed with cooking spray and baked it at 350 for one hour. This made 6 servings at about 2 grams of fat/serving. And I didn’t waste any eggplant. The women of Goregaon Road would be proud of me. My neighbor and I have been taking turns making dinner to eat as we watch the presidential debates. This is a handy casserole because you can make it a day ahead if you need to and cook it when you get wherever you’re going to eat it. Also, it is large, and of course, I’m always looking for something I can eat another day (and leave some with Florence as well). An additional benefit is that it used up an excess of corn tortillas in my refrigerator. The original recipe, from Cooking Light, set aside this and that for garnishes to be added in the last 5 minutes of cooking. I was less interested in glamour than tasty and quick to bake, but you could hold back a bit of the green onions, olives, and cheddar and put them on 5 minutes before the casserole is done. I also lightened the recipe up a bit. 6 ounces reduced fat cheese (I would have just used that pre-shredded reduced fat four cheese Mexican cheese mix, but I only had 2 ounces of it in the refrigerator. So I added whatever reduced fat cheese was there, mostly cheddar and a little Swiss. If you are going to bake the casserole right away, preheat oven to 350 F.
Note on the shredded chicken: You can use any cooked chicken breast you have, like from soup, etc. I defrosted a couple of chicken breasts and put them in a shallow bowl with about a cup of water. I microwaved them, covered, on 7 for about 4 minutes on each side. They were ugly, but very juicy, and could easily be shredded with a fork. Coat a large non-stick skillet with cooking spray. Place over medium heat. Add onion and garlic and sauté until tender but not brown, stirring occasionally. Add shredded chicken, beer, red pepper, and tomatoes. Cook until most of the liquid evaporates, stirring occasionally. (Confession, after 20 minutes, my liquids hadn’t evaporated enough, so when I used the filling, I used a slotted spoon to drain it a little more.) Remove chicken mixture from the heat. Stir in green onions, olives, and chilies. Set the mixture aside. Put eggs substitute in a medium bowl and set aside. Whisk together flour, salt, cumin, and coriander in a medium saucepan. Gradually whisk in milk, stirring until it is well-blended (be sure no lumps are clinging to the sides). Place over medium heat and cook for 8-10 minutes or until thick, stirring constantly. Yes, I know it is boring to stand and whisk. Pour yourself something tasty to drink and think of far away places. Just don’t stop whisking or you will have a lumpy mess. Believe me, I know. When it is nice and creamy and thick, gradually add the hot milk mixture to the egg substitute, stirring the eggs substitute and milk mixture constantly with a whisk. Set aside. OK, now the fun begins. You should have a big pan full of chicken mix, a bowl of white sauce, a bowl of shredded cheese, and tortillas. Spray a 2 1/2 quart round casserole or soufflé dish with cooking spray. Put a half cup of white sauce on the bottom of the casserole dish. Arrange 4 tortilla halves over the sauce, top with 2 cups of chicken mixture, 1/2 cup of white sauce, and 1/2 cup of cheese. Repeat the layers twice more – you will wind up ending with cheese – sprinkle all the remaining cheese over the top. If you are baking this right away, bake for 40 minutes at 350, or until bubbly. If you are putting it in the refrigerator ahead of time, bake for 1 hour (mine took about 15 minutes longer) at 350, or until bubbly. Serve with salsa and low fat sour cream. This makes 8 servings with about 6 grams of fat per serving. I have lost 200 pounds. I did not do it through surgery – I don’t like knives and needles – or by joining a club, vigorous exercise, or rigorous dieting. I did it by gourmet cooking. To be precise, by cooking low fat, really delicious food. I love to cook as much as I love to eat. Food magazines are some of my favorite reading. I would feel deprived if I couldn’t have the sensuous experience of good food crossing my lips. This blog is about my perpetual feast, my passionate love of food, with recipes, photos, and occasional advice and principles that I have learned along the way.